I.M.F. demands Greek debt relief from Europe in return for bailout. 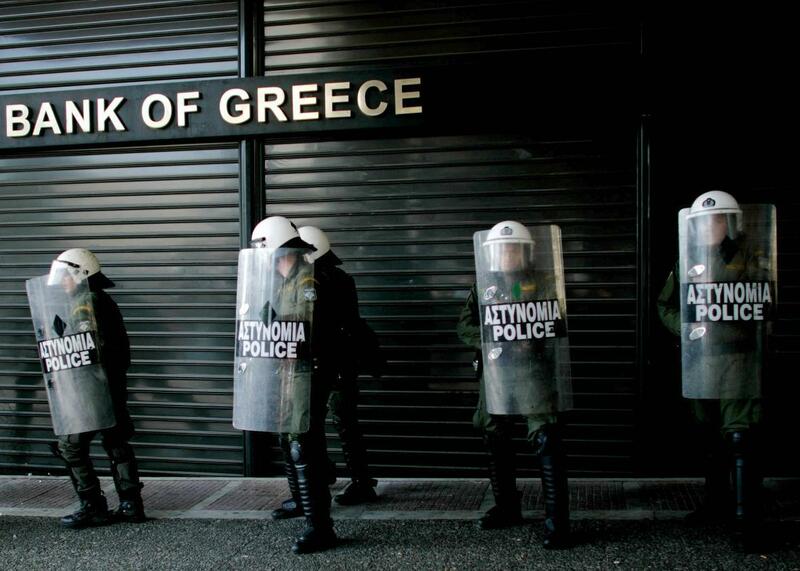 Riot police line up outside a closed branch of the National Bank of Greece during a 24-hour general strike on February 24, 2010 in Athens. Threatening to refuse to lend further funds to the country, the International Monetary Fund on Tuesday declared that Greece’s current debt level is unsustainable despite the new austerity measures it provisionally agreed to in return for another European bailout. Here’s what the I.M.F. said on Tuesday of the Greek debt, which now exceeds 300 billion euros. Greece’s public debt has become highly unsustainable… The financing need through end-2018 is now estimated at €85bn and debt is expected to peak at close to 200 percent of GDP in the next two years, provided that there is an early agreement on a program. Greece’s debt can now only be made sustainable through debt relief measures that go far beyond what Europe has been willing to consider so far. “The I.M.F. study… said European countries would have to give Greece a 30-year grace period on servicing all its European debt, including new loans, and a dramatic maturity extension,” Reuters reports. “Or else they must make annual transfers to the Greek budget or accept ‘deep upfront haircuts’ on existing loans.” This is not the first time the I.M.F. has made its position clear, as the organization submitted its proposals to the eurozone negotiators last weekend, but its debt-relief warnings went unheeded and were left out of the agreement struck with Athens. The deepening austerity required by the latest deal is deeply unpopular in Greece, which is scheduled for a vote in parliament on Wednesday on whether to accept the latest terms to secure a bailout. “In an interview with state television, [Tsipras] said that although he did not believe in the deal, there was no alternative but to accept it to avoid economic chaos,” according to Reuters. Tsiparas, as well as the vast majority of Greeks, polls show, believe accepting Europe’s deal is the only option. Before the I.M.F. upped the ante on its warning, the euro creditors had offered minimal debt restructuring. With little leverage and increasing rumblings in Germany that a Greek exit from European organizations might be the next step, the I.M.F.’s threat to pull support for a deal without substantial debt relief seems likely to spur both sides into accepting a more permanent solution to the ongoing crisis—whether that solution keeps Greece in Europe or not remains to be seen.